With warmer weather settling in and spring just around the corner, it might soon be time to fire up your AC system. 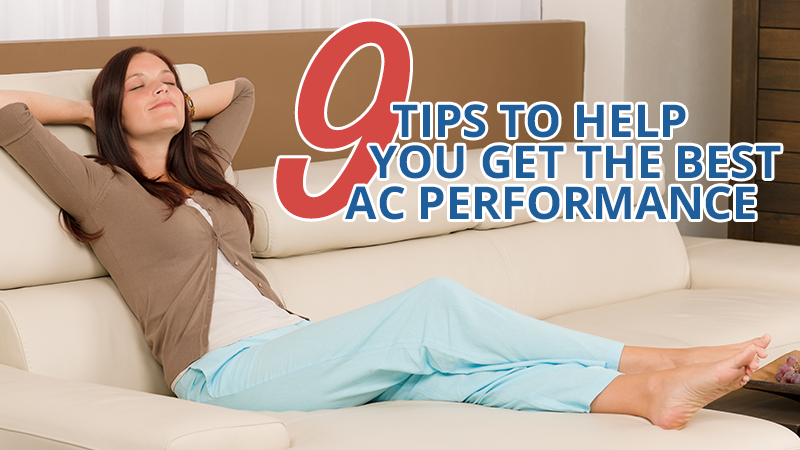 Beat the heat and give Metro Comfort Systems a call for all of your HVAC needs or AC repair. To keep you cool all spring and summer long, we have listed nine tips to keep your air conditioning running strong. Digital thermostats are more efficient than analog thermostats. Manual adjustments on an analog thermostat cause unnecessary wear and tear on your air conditioning system. Regular filter changes — every one to three months — are a simple way to keep your air conditioning running at maximum efficiency. Check the filter monthly to start off, and replace it as needed to figure out how often it needs to be changed. You want to make sure your air conditioning is working before the hottest days of the year come around, so schedule annual maintenance with us and receive a 10 percent discount on parts. The unit needs room to breathe, so don’t let plants grow too close to it. Fences and covers directly on the unit can also be harmful to its air circulation. Spray down your outdoor air conditioning unit with a garden house to clean out any dirt or grime buildup that could be slowing the unit down. Vents or returns closed off by furniture or other large objects can harm your air conditioning’s efficiency. Try rearranging your furniture for something different and keep those air vents clear. If your house is too warm, or the unit is running constantly or making strange noises, call us right away. The sooner we can fix the problem, the less likely you will have to face bigger problems. Talk to your HVAC contractor about any questions or concerns you might have. Our team of experienced technicians is glad to share its HVAC knowledge with you. We can get almost any AC unit running again, but you might save money in the long run by replacing a unit that is causing problems. HVAC systems generally last 15 to 20 years, and new systems can cut your energy costs with higher efficiency levels. Contact Metro Comfort Systems for all of your HVAC needs, and let us put our 75 years of knowledge and experience to work for you.